Updated Friday April 4, 2014 by AUBL Miami. Bunting occurs when a batter holds the bat in the hitting zone and, without swinging, lets the ball make contact with it. The idea is to deaden the ball so that the baserunners can advance (or the hitter can get to first base) while the opposing fielders run in to make a play. Anyone may be called upon to bunt at anytime during the season. For example, say you come to bat with the winning run on first and nobody out in the bottom of the ninth inning; in this case, a sacrifice bunt would get the runner into scoring position. Bunts can help win ball games, so everyone who swings a bat should know how to lay down a bunt. Pitchers need to know how to bunt, even if they play in a league that allows designated hitters. The most commonly used bunting stance is the pivot. Take your normal stance at the plate while waiting for the pitch. As the ball comes to the plate, pivot your upper body toward the pitch while keeping your feet in their stance position (see Figure 1). Figure 1: An ideal bunting stance. You can flow into a pivot quickly so you maintain an element of surprise. In the event of a fake bunt — where you "show" bunt to pull in the infielders and then swing away to drive the ball past them — the pivot allows you to easily resume a standard batting stance. With a pivot stance, getting out of the path of errant pitches is easier. The squared stance is your other bunting option — and perhaps the best option for players just starting out. Bring your feet parallel to home plate and each other while keeping them shoulder-width apart (see Figure 2). This stance gives you better plate coverage and a longer look at the ball than the pivot, but it also has its drawbacks. 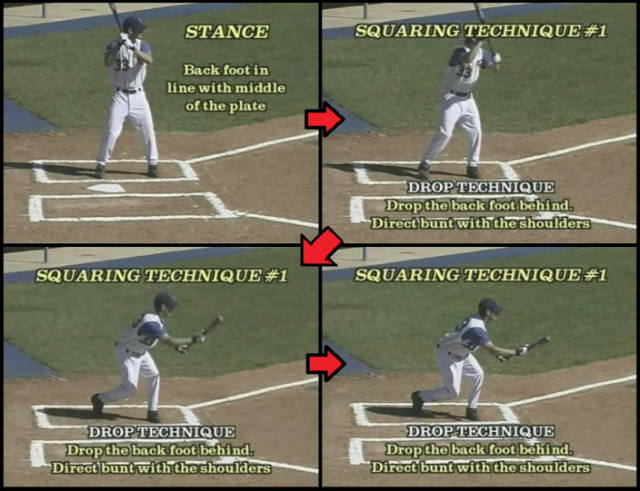 Figure 2: The squared-stance bunt. You become more vulnerable to being hit by a pitch, you risk stepping out of the batter's box (in which case the umpire may call you out), and, because you have to get set in this position early, you decrease your chances of surprising the opposition. Whether you pivot or square around to bunt, make sure you drop into a slight crouch and square your shoulders toward the pitcher. Shift your weight forward as you stand on the balls of your feet. 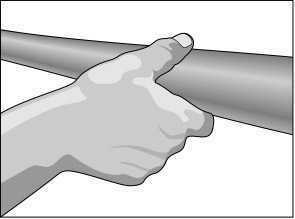 Hold the bat handle firmly with your bottom hand so that you can control it, but don't squeeze the handle or you may hit the ball too hard. Slide your top hand up near the bat label. Pinch the barrel with your fingers and thumb, your thumb on top. This action shapes the hand into a U that absorbs any impact when the ball strikes your bat. It also protects your fingers (see Figure 3). Figure 3: Holding the bat for the bunt. Many bunters hold their bats parallel to the ground while waiting for the pitch. Some think it is better to hold the top of the bat barrel slightly higher than the handle. This strategy keeps you on top of the ball, which is where the bunter has to be. If you come up underneath the pitch, you pop it up. If you hit the ball dead center, you produce a soft line drive that can be converted into a double play. Hold the bat near the top of your strike zone so that you know that any pitch over your bat is a ball. This prevents you from offering at high pitches, which are the hardest to bunt. 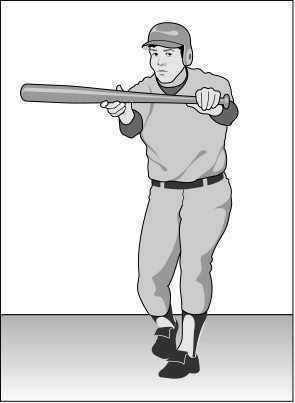 Try to bunt a low pitch. Watch the ball make contact with the bat in front of you and the plate. Give with the ball, don't push it. You should experience the sensation of "catching" the ball with your bat and guiding it to its destination. Let your bottom hand direct the bat's angle. With the sacrifice bunt, the bunter advances the base runners while giving up a chance for a base hit. With a runner on first, bunt toward the area between the mound and the first baseman. With a runner on second or runners on first and second, bunt toward the third baseman to bring him off the bag (see Figure 4). Figure 4: Where to place the sacrifice bunt. Running the squeeze play: The squeeze play is a sacrifice bunt with a runner on third base. If a manager calls for a squeeze play, it's usually during the later innings of a close game with less than two outs. Running the safety squeeze: On a safety squeeze, the runner breaks for home only after you drop your bunt on the infield. 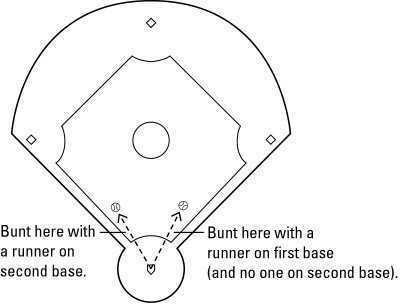 If the bunt isn't good, the runner stays at third. As the bunter, your job is to push the ball away from the pitcher and towards first or third base. Running the suicide squeeze: The suicide squeeze is a riskier play. It requires the runner to dash toward home plate as the ball leaves the pitcher's hand — he is coming home no matter what kind of bunt you drop! So you can't take the pitch even if it is out of the strike zone. You must bunt the ball somewhere. Don't be too finicky about placement. With the runner bearing down on home, just bunt the ball to the ground in fair territory, and you drive in a run. Even if you bunt it foul with less than two strikes on you, the worst that can happen is the runner gets sent back to third. If you don't make contact with the ball, the catcher has the runner dead at the plate (which is why it's called the suicide squeeze). To successfully bunt for a hit, you must catch the opposition unaware. This is where the pivot gives you an advantage: It enables you to deceive the infielders longer than the squared-around stance. To bunt for a hit, you should be in motion as the bat makes contact with the ball. You should also grip the bat a little more firmly than you did for the sacrifice. Left-handed hitters use drag bunts, so named because the bunter appears to drag the ball along the first baseline as he runs toward first. To execute the drag bunt, shift your weight onto your right foot as you pivot and step toward first base. 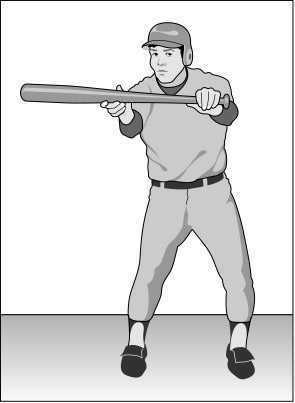 Hold the bat solidly with its head pointed toward third. Don't pull back the bat or the ball will go foul. You should be moving into your second stride as you make contact with the ball. With your running start, you should beat out the bunt, if it stays fair.